3 Reasons Not to Skip Leg Day | Valet. We get why so many guys neglect their legs when it comes to their fitness. It's easy to focus on the more noticeable "mirror muscles," like your arms, chest and abs. But if you're only training above the belt, you're missing out on some big benefits. Because your lower body is home to some of your largest muscles. And experts agree that the benefits of training your legs go far beyond merely beefing up your quads and calves. Herewith, three reasons to work your legs. If you're looking to shred fat, swap your cardio for some weighted leg exercises. "Working bigger muscles in multi-joint exercises like squats, deadlifts or lunges will require more 'work' from the heart and brain and higher levels of metabolism compared to exercising smaller muscle groups," says trainer Jon-Erik Kawamoto, a Newfoundland-based certified strength and conditioning specialist. And according to research published in the Journal of Applied Physiology, your metabolic rates skyrocket after heavy weight training and stay elevated long after your workout and "enhance post exercise lipid oxidation [fat burning]." Testosterone is essential for developing and maintaining muscle mass. And working the large, lower body muscles in your legs is a surefire way to spike your T levels. 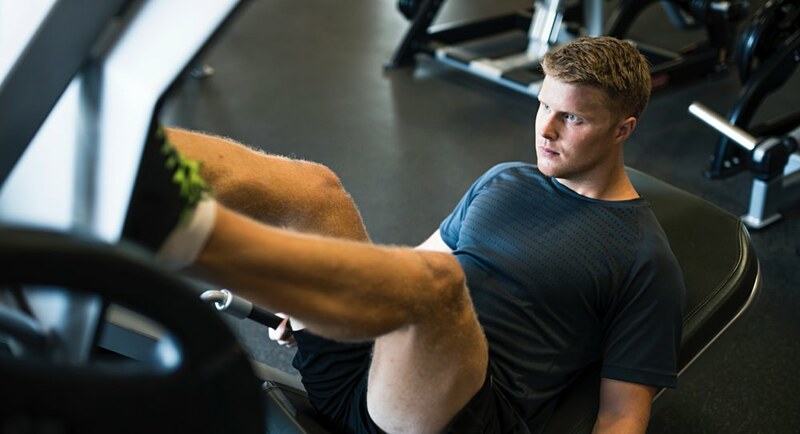 "In general, all types of exercise stimulate the release and production of testosterone," says sports medicine doctor Jordan Metzl, MD, author of The Exercise Cure. "But there is data to suggest that lifting weights and high-intensity work might stimulate the greatest release of testosterone." And increasing your body's testosterone will in-turn increase your muscle-building and fat-loss potential. You put in the work and the benefit is a more efficient body. Doctors from the Washington University School of Medicine discovered that after heavy weight training, you supercharge your body's insulin sensitivity and the rate at which you absorb and use glucose. That, combined with a study published in the American Journal of Physiology, which found "early post exercise [eating] enhances accretion of whole body and leg protein," means that a big post-workout burger will be absorbed efficiently, won't be stored as fat and will effectively aid in repairing and regrowing muscles. Is it squat o'clock? These moves make for an efficient and effective leg-strengthening session. A great way to build the quadriceps, and because of the core strength needed to stay upright, it requires more total-body athleticism than the standard back squat. Dumbbell walking lunges are a conditioning kick-in-the-pants and they target every muscle in the legs. It requires plenty of balance, coordination and strength. This requires slightly straighter legs than the conventional deadlift, and it better targets the hamstrings and glutes (to counter the quad-dominant front squat). Working out at home? You can omit this, but a leg press is a great finisher exercise. It offers direct targeting of the quads and allows you to really hit 'em hard. Move beyond the simple curl and grow muscle fast with this easy full-body weight routine.